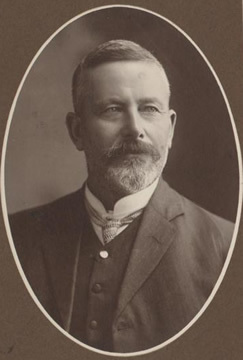 William Harrison Story, trade unionist, businessman and politician, and son of George and Eliza Story, née Morgan, was born in Mitcham, South Australia on 31 May 1857. Shortly thereafter the family moved to Norton Summit as William’s father, at that time occupied as a gardener, had been commissioned to lay out and plant the grounds of ‘Drysdale’, the home of Thomas Playford. In 1863, Story senior was appointed clerk to the East Torrens District Council, which may have contributed to his son’s early interest in municipal affairs. William was educated at the Norton Summit State School and, after working at various temporary jobs, was apprenticed as a bricklayer to several well-known builders in South Australia. At some time, Story became president of the Operative Masons’ and Bricklayers’ Society and delegate to the United Trades and Labor Council (UTLC). By 1884, he was a member of the committee of the UTLC which was instrumental in forming the United Labor Party of South Australia. Later in his parliamentary career, he referred to this early work: ‘I was one of the original founders of the Labour movement, and worked for it before the present Labour party in South Australia came into existence’. By 1891, he had entered into a successful building partnership with D. Sutherland of Glenelg. An advocate of the municipal ownership of public services, in 1895 Story was elected to the Kensington and Norwood District Council (1895–1901), serving as mayor for two years. He also became president of the South Australian Builders’ and Contractors’ Association (1902–04), the forerunner of the Master Builders Association. Story, who it seems on several occasions had declined nomination for the South Australian Parliament, stood successfully for the Senate at the 1903 federal election. He described the industrial sector which he represented as ‘the backbone of the State’. During debate on the Conciliation and Arbitration Bill (1904), he assured senators that ‘employers have nothing to fear from preference to unionists, but . . . much to gain’, claiming that his experience as an employer had shown him that the best workers were those in trade unions. As an employer and a trade unionist, he felt that in order for employers and unionists to benefit from the proposed legislation, there needed to be strong organisation on both sides. He saw ‘preference to unionists’ as the vital clause in the legislation, one that would eliminate cheap, shoddy workmanship and encourage workers to organise and thereby maintain the necessary machinery for arbitration. While later leaving the Labor Party, he never forgot his trade union roots, claiming in 1916 that he was ‘the oldest trade unionist in the Chamber’. Story formed a rather sceptical view of the parliamentary process, considering that decisions were too often made along party lines rather than as the result of informed debate. He felt that much valuable debating time was wasted in discussion that should take place in committee. His membership of parliamentary committees in 1914 included the public works committee whose findings, he considered, resulted in immense savings to the Commonwealth. It is possible that his reservation about the role of political parties moderated, for in 1918 he was appointed Government Whip in the House of Representatives, a task which, according to Prime Minister Bruce, he carried out with ‘absolute imperturbability’. Story’s central concern in debate was the development of Australia’s manufacturing industry and the welfare of Australian workers. He argued that a first essential in this process was the realisation of the nation’s industrial potential: ‘I always feel grieved when I find Australians willing to believe that nothing good can come out of Australia’. He believed the existence of huge combines inhibited this development and found every opportunity to advocate some degree of government control or to recommend nationalisation. He constantly measured the advantage, or otherwise, to Australian industry of the imposition, or lifting, of a tariff. During the debate on the tariff in 1921, he warned that while changes to the tariff might please certain industries, the counter side in many cases would be to increase building costs, rents and unemployment. Story saw the development of railways as essential to Australia’s industrialisation as well as to its defence. He was a strong supporter of the Kalgoorlie–Port Augusta Railway line as well as of the Port Augusta–Oodnadatta line, proposing that the latter be extended to the MacDonnell Ranges. He felt that the development of the Northern Territory was of far more importance to Australia than the building of a national capital. He constantly urged senators to read the specialist reports and surveys on the Northern Territory, so that the potential of this ‘rich province’ might be realised. He pursued the matter throughout his career in both Houses of Parliament. In 1908, he deplored the reopening of debate on the federal capital site, feeling that party pressure would prevail over common sense and that Canberra would replace Dalgety as Australia’s seat of government. In 1910, he stated that it would be in the national interest to amend section 125 of the Constitution to allow the choice of a capital site to be made in any part of Australia. ‘Many of us’, he said, ‘look forward to the time when the boundaries at present existing between New South Wales and Victoria and other States will be wiped away altogether, and there will be one undivided Australia’. His realisation of the benefit to Australia of the navigation and irrigation of the River Murray caused Story to speak at length on the River Murray Waters Bill and on the history of the issue since the Intercolonial Conference of 1863. He commended the Bill’s acceptance to the Senate as a fair compromise between the claims of Victoria, New South Wales and South Australia, one that was a‘monument to the patience, the skill, and the diplomatic tact of the statesmen of Australia’. Story’s firm conviction that every man should contribute in whatever way possible to the war effort foreshadowed the stand he later took during the conscription crisis. He believed in national self-sacrifice in time of war: ‘if we call upon men to risk their lives in the defence of Australia and the Empire, we should have the right to call upon the men who have the money to give the whole of it, and without interest, if it were needed for the protection of Australia’. When the ‘no confidence’ motion in the leadership of W. M. Hughes was passed in the Caucus meeting of November 1916, Story followed Hughes into the National Labour Party (later to become the Nationalists). During the conscription debate, Story suggested that the Labor Party’s insistence on unanimity on the proposed conscription referendum was not in line with the platform upon which the Party had been founded. In debate on the War-time Profits Tax Assessment Bill in 1917, he opposed tax exemption for manufacturers of arms and other defence items, arguing that ‘all extraordinary profits which have been made either by an individual or a business, on account of the war, are proper subjects for taxation’. Story had become deeply disillusioned with what he perceived as the divisive and tyrannical industrial element that had swept into the trade unions and which he felt defeated the very ideals for which the early members had worked. ‘I want to tell the people of Australia’, he assured senators, ‘that I am just as good a Labour man as ever I was . . . I believe in every plank of the party platform as strongly as ever I did . . .’. Nevertheless, his career as a Labor politician was over. Story resigned his seat in the Senate on 3 April 1917 and, following an arrangement with the South Australian Liberal Union, stood successfully for the House of Representatives seat of Boothby at the May 1917 federal election. He was re-elected in 1919. According to the Advertiser, Story’s success as a member of the House of Representatives was attributable to the immense popularity and the great respect in which he was held in his electorate. However, his uneasy transition from the Labor Party to the Nationalists, and the death of his youngest son, Sergeant Ward W. Story, on active service in France in 1916, may have undermined his health. Probably due to changing political alignments in South Australia, he was defeated for Boothby in 1922. In 1924, just a few months before he died, he unsuccessfully contested a seat in the South Australian Legislative Council. His pre-election speech showed that the values he had cherished for more than twenty years were still uppermost in his mind: the welfare of the working class and the expansion of Australian manufactures and markets. Story was one of the oldest members of the Adelaide Democratic Club, having held the offices of president and trustee. He was active in local sporting organisations and cultural societies and was associated for many years with the Norwood Lodge and the Emulation Lodge of Freemasons of which he was a past master. In 1911, he was a member of the parliamentary party that visited England on the occasion of the coronation of King George V. On 16 February 1880, he had married Sarah, née Malcolm, in Brompton. It seems that Story had a happy disposition and as well as eight children, a large circle of friends. He had been a resident of Norwood for about thirty-nine years when he died there on 13 July 1924. His wife, sons, Herbert and Reginald, and daughters, Winifred, Nell, Gwen, Vera and Olive, survived him. The President of the Senate, Thomas Givens, said that ‘no more likeable man has ever entered this chamber’, adding that no one could have been ‘more unselfish or more assiduous in the discharge of his duties’. The Advertiser commented: ‘One of the most widely-known and highly-respected politicians whom South Australia has produced’. H. T. Burgess (ed. ), The Cyclopedia of South Australia, vol. 1, 1907, Cyclopedia Company, Adelaide, pp. 177–178; George W. Gooden & Thomas L. Moore, Fifty Years’ History of the Town of Kensington and Norwood, Webb & Son, Adelaide, 1903, pp. 75–78. Sid O’Flaherty, A Synopsis of the Formation and the Historical Records of the Australian Labor Party South Australian Branch, Adelaide, 1956, p. 64; Register (Adelaide), 10 December 1903, p. 7; CPD, 14 March 1917, p. 11388; Worker (Sydney), 12 December 1903, p. 4; Gooden and Moore, Fifty Years’, p. 77; Burgess, The Cyclopedia of South Australia, p. 178; K. C. West, The Builders: The History of the Master Builders Association of South Australia, 1884–1984, Master Builders Association of South Australia, Adelaide, 1984, pp. 22–23, 145. Advertiser (Adelaide), 10 December 1903, p. 8; CPD, 28 October 1904, pp. 6289–6290, 22 September 1916, p. 8936. CPD, 23 August 1905, pp. 1312–1313, 16 July 1924, pp. 2072, 2108, 13 September 1917, p. 2038. CPD, 3 March 1908, p. 8537, 6 March 1908, p. 8691, 10 March 1908, p. 8762, 3 March 1908, p. 8542, 2 December 1908, pp. 2482–2483, 21 August 1906, p. 3089, 4 October 1907, p. 4260, 3 June 1914, pp. 1720–1721, 21 November 1907, pp. 6346–6347, 31 March 1908, p. 9820, 23 June 1921, pp. 9290–9291, 22 June 1921, p. 9258. CPD, 5 December 1913, p. 3834, 23 August 1905, pp. 1313–1314, 26 September 1912, pp. 3493–3499, 12 November 1914, p. 538, 3 December 1909, pp. 6855–6856, 12 November 1914, pp. 534–537, 12 August 1920, p. 3471. CPD, 5 November 1908, pp. 1993–1999, 14 September 1910, pp. 3053, 3054. CPD, 10 November 1915, pp. 7350–7354. CPD, 28 July 1915, p. 5380; Geoffrey Sawer, Australian Federal Politics and Law 1901–1929, MUP, Carlton, Vic., 1956, p. 130; N. J. O. Makin, A Progressive Democracy, Adelaide, 1918, p. 78; Jim Moss, Sound of Trumpets: History of the Labour Movement in South Australia, Wakefield Press, Netley, SA, 1985, p. 245; CPD, 14 December 1916, pp. 9848–9849, 30 August 1917, p. 1533. CPD, 14 March 1917, pp. 11387–11395, 14 December 1916, p. 9852. Advertiser (Adelaide), 14 December 1922, p. 13, 14 July 1924, p. 12; Patrick Weller (ed. ), Caucus Minutes 1901–1949: Minutes of the Meetings of the Federal Parliamentary Labor Party, MUP, Carlton, Vic., 1975, vol. 1, p. 436; Advertiser (Adelaide), 28 December 1922, p. 9; Sawer, Australian Federal Politics and Law, p. 221; Advertiser (Adelaide), 28 December 1922, p. 9, 1 April 1924, p. 15. Burgess, The Cyclopedia of South Australia, p. 178; Gooden and Moore, Fifty Years’, p. 77; Information supplied by Beth Brittle, History Centre, City of Kensington and Norwood, Kent Town, SA, and Research Team, SLSA;CPD, 16 July 1924, pp. 2072–2073; Advertiser (Adelaide), 14 July 1924, p. 12. This biography was first published in The Biographical Dictionary of the Australian Senate, vol. 1, 1901-1929, Melbourne University Press, Carlton South, Vic., 2000, pp. 172-175.